(Nanowerk News) Javier Vela, scientist at the U.S. Department of Energy's Ames Laboratory, believes improvements in computer processors, TV displays and solar cells will come from scientific advancements in the synthesis of low-dimensional nanomaterials. Ames Laboratory scientists are known for their expertise in the synthesis and manufacturing of materials of different types, according to Vela, who is also an Iowa State University associate professor of chemistry. In many instances, those new materials are made in bulk form, which means micrometers to centimeters in size. Vela's group is working with tiny, nanometer, or one billionth of a meter sized, nanocrystals. "We're trying to find out what happens with materials when we go to lower particle sizes, will the materials be enhanced or negatively impacted, or will we find properties that weren't expected," Vela said. "Our goal is to broaden the science of low-dimensional nanomaterials." In an invited paper published in Chemistry of Materials ("Synthetic Development of Low Dimensional Materials"), Vela and coauthors Long Men, Miles White, Himashi Andaraarachchi, and Bryan Rosales discussed highlights of some of their most recent work on the synthesis of low dimensional materials. One of those topics was advancements in the synthesis of germanium-based core-shell nanocrystals. Vela says industry is very interested in semiconducting nanocrystal-based technologies for applications such as solar cells. Small particle size can affect many things from transport properties (how well a nanocrystal conducts heat and electricity) to optical properties (how strong it interacts with light, absorbs light and emits light). This is especially true in photovoltaic solar cells "Let's say you're using a semiconductor material to make a solar device, there's often different performance when solar cells are made from bulk materials as opposed to when they are made with nanomaterials. Nanomaterials interact with light differently; they absorb it better. That's one way you can manipulate devices and fine tune their performance or power conversion efficiency," said Vela. Beyond solar cells, Vela says there's tremendous interest in using nanocrystals in quantum dot television and computer displays, optical devices like LEDs (light-emitting diodes), biological imaging, and telecommunications. He says there are many challenges in this area because depending upon the quality of the nanocrystals used, you can see different emission properties, which can affect the purity of light. "Ultimately the size of the nanocrystals being used can make a huge difference in the cleanliness or crispness of colors in TV and computer displays," said Vela. "Television and computer technology is a multibillion dollar business worldwide, so you can see the potential value our understanding of properties of nanocrystals could bring to these technologies." In the paper, Vela's group also discussed advancements made in the study of synthesis and spectroscopic characterization of organolead halide perovskites, which Vela says are some of the most promising semiconductors for solar cells because of their low cost and easier processability. He adds photovoltaics made of these materials now reach power conversion efficiencies of greater than 22 percent. Vela's research in this area has focused on mixed-halide perovskites. He says his group has discovered these materials exhibit interesting chemical and photo physical properties that people hadn't realized before, and now they are trying to better understand the correlation between the structure and chemical composition of perovskites and how they behave in solar cells. "One of our goals is to use what we've learned to help lower the cost of solar cells and produce them more reliably and readily," Vela said. 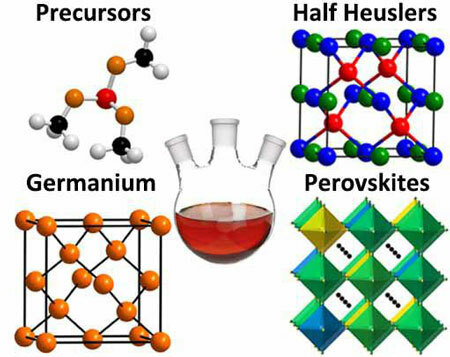 In addition, Vela's group is studying how to replace lead in traditional organolead halide perovskites with something less toxic, like germanium. "In principle, this is an area that should be much better known, but it's not," said Vela. "When we've been able to substitute germanium for lead, we have been able to produce a lighter perovskite, which he says could positively impact the automotive industry, for example. "This could have great implications for transportation applications where you don't want a lot of lead because it's so heavy," said Vela. Going forward Vela says his group's focus will be on advancing the science in low-dimensional materials. "We're not working with well-known materials, but the newest; the most recently discovered," Vela said. "And every time we can advance the science we're one step closer to opportunities for more commercialization, more production, more manufacturing and more jobs in the U.S."